I had always heard the melody of rawanhattha on CDs or as a part of a live performance by a group of musicians. A simple instrument made from branches of trees and half coconut shell …. The story goes like this ( as told by the musician) – in mythology Ramayan, the demon king Rawan tore his veins ( of the hand) and created this stringed instrument where the veins became the strings. He then started playing this instrument dressed as a saint and attracted sita to step out of the protection line ‘Lakshman Rekha ‘ and then abducted her. 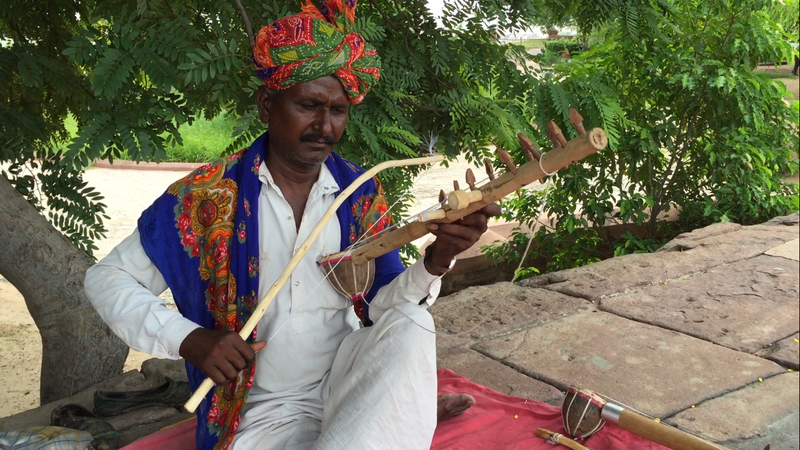 I met this musician at Jaswant thada, Jodhpur. He was sitting in a corner and playing the instrument on his own ….. The first song as a famous Rajasthani folk song – kesaria balam, padharo mharo des…. Post that he started playing other tunes ….. Outstanding and unforgettable. He started talking to us about the instrument and I requested permission to record that. He accepted and that’s how I am bringing to u this amazing melody from a little known instrument, the beauty of which is the slanting white wire that draws its sound from 5 metal wires below. Pls share this post if u like it . Wud love to see more and more people knowing about this……..
Nice to know about a fact. Interesting.